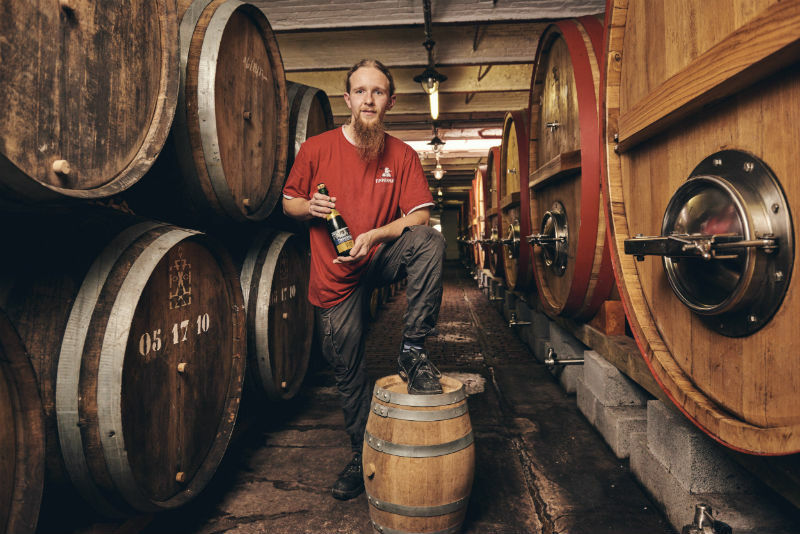 Discover Bram, our new brewer at the Timmermans Brewery! I’m 24 years old, my birthday is on the 30th of May. Where were you working before you joined the Timmermans brewery? Before I started at the Timmermans brewery, I worked as a lab technician at Organic Waste Systems NV in Ghent. OWS conducts research into biodegradability, compostability and anaerobic fermentation of different waste flows, so that the waste of companies can be utilized in an ecological manner. More specifically, I conducted tests to investigate the production of biogas and other byproducts from different types of waste. This research has been very educational for me. Have you always wanted to work in the beer business? As a child, I had the wildest dreams to become an astronaut, a doctor or a scientist. In secondary school I noticed that I had a big interest in scientific subjects, but I didn’t know yet in which business I wanted to end up. I drank my first speciality beers in college and those beers made such an impression on me taste wise, that I wanted to know more about all the different kinds of beer and the way they are being produced. When I saw that the biochemistry training also offered a specialization in brewing technology, the choice was easy to make. It was at that moment that I decided I wanted to work in the beer business. Knowing that the beers that are made here and to which I can contribute, will be appreciated by so many people. That gives me an enormous feeling of satisfaction over and over again. I also learned a lot since I began to work here and I hope to keep learning in the future. Last but not least, I’m surrounded by nice colleagues with an equally great passion for beer. In many breweries, parts of the manufacturing process are being automated nowadays and the production is controlled from a PC. At the Timmermans Brewery, most things are still being done manually and this makes the job more labour-intensive than I expected. But once I have found the right work flow, I don’t think that this will be an issue anymore. I have already tasted so many beers, it’s getting hard to pick a favorite. Most of the time I have a preference for quadruple beers, such as “Kasteel Barista Chocolate Quad”, “Gulden Draak 9000” and “Gouden Carolus Cuvee van de Keizer Imperial Dark”. Spareribs, but I also love to eat pasta. I’m a big fan of heavy guitars. You can usually find me at festivals such as Graspop, Alcatraz and Antwerp Metal Fest. I also try to see some smaller concerts on a regular basis. I like historical movies such as Gladiator, Kingdom of Heaven and Troy. I like to do some sports in my free time, especially running. I regularly participate in recreational running events and more recently I try to be a bit more competitive. When I’m not wearing my running shoes, I like to go out with friends. 70000 Tons of Metal. A five day cruise in the Caribbean Sea, combined with a festival. If you won 1 million euros, what would you do with it? I would probably put a large part aside to save for later. I would also use a part for my family and friends, to get them a nice treat. With the remaining part I might try to travel a bit more often. I like making city trips and I want to try to see as much as possible from the world.